Digging, weeding, planting, hefting and hauling loads of compost; gardening is often tough physical work! It's not a hobby you would intuitively think would be suited to someone in late middle life or even older. 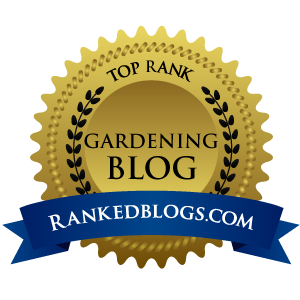 If you've been following this series of blog posts, you'll know that now by now that Duff and Donna Evers have a very large garden, but what you may not realize is that they are both gardeners in their seventies. If Donna could interject right about now, she'd probably tell you that gardening keeps them fit and young at heart. She might even toss in a lighthearted joke about gardening saving them a fortune on a gym membership. 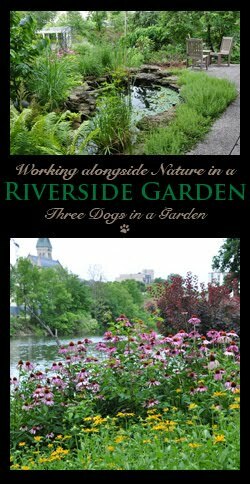 It may be a lot of physical labor, but gardening is also a passion; a love of plants and nature that both she and Duff share. 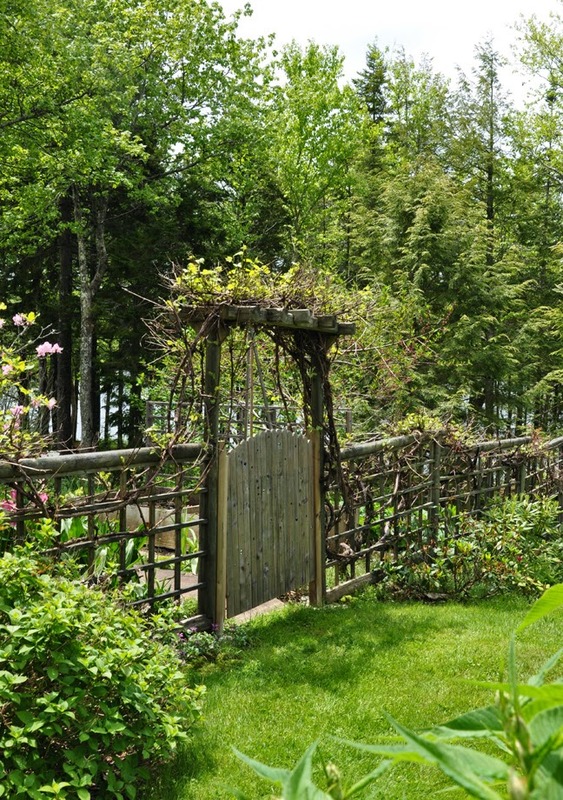 In this, the final post of the series on their garden near Halifax Nova Scotia, we are going to look at the little woodland garden to one side of the house, and to the what Donna refers to as the "gate of lost marbles." 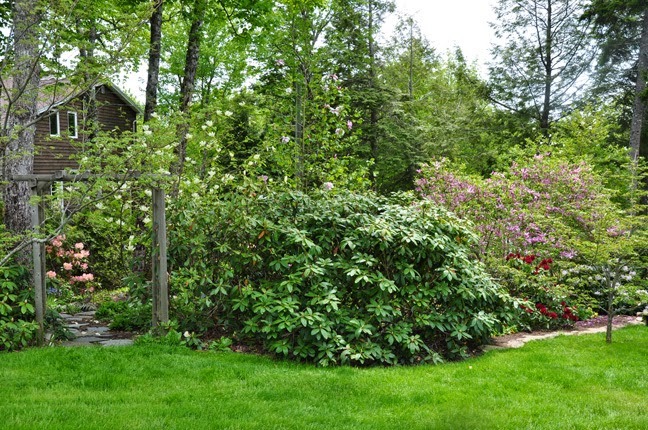 "This area started out with a cedar hedge between us and our neighbour. There is a path through the hedge for visiting back and forth, by both people and pets." 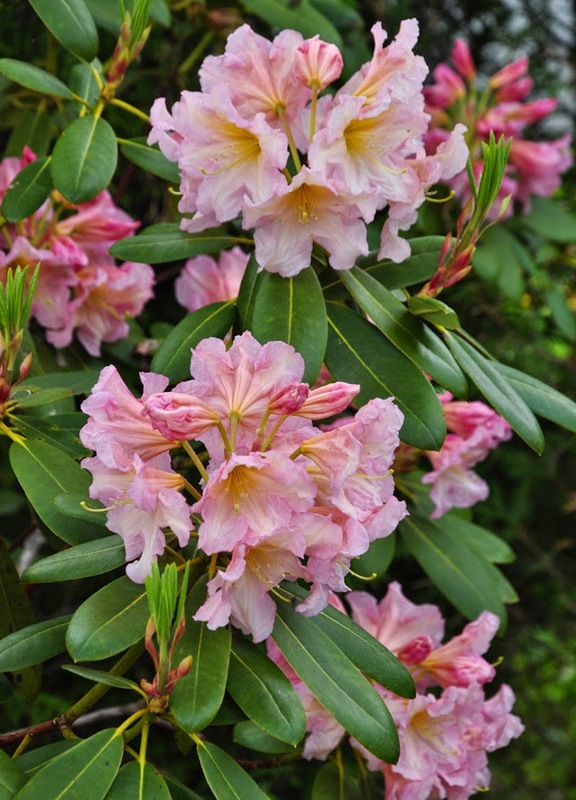 "On the edge nearest the lawn, we planted a border of rhododendrons. In the area between these plantings, there were native hemlock, maples and poor spruce. Again, we weren't planning to garden in this area. Nature took care of the unsightly spruce, we limbed-up the hemlocks and bought more plants. Another garden to fill." "Now we needed a way in and out of this garden. Duff built arbours leading into the garden at both ends." Miss Cleo makes a grand entrance. "There is also an arbour halfway down the garden and an arbour with a series of window frames that runs along a retaining wall. I love the view of the lake through these 'window frames'. The arbours all support clematis or climbing vines. Clematis flammula is a wonderful scented late bloomer." 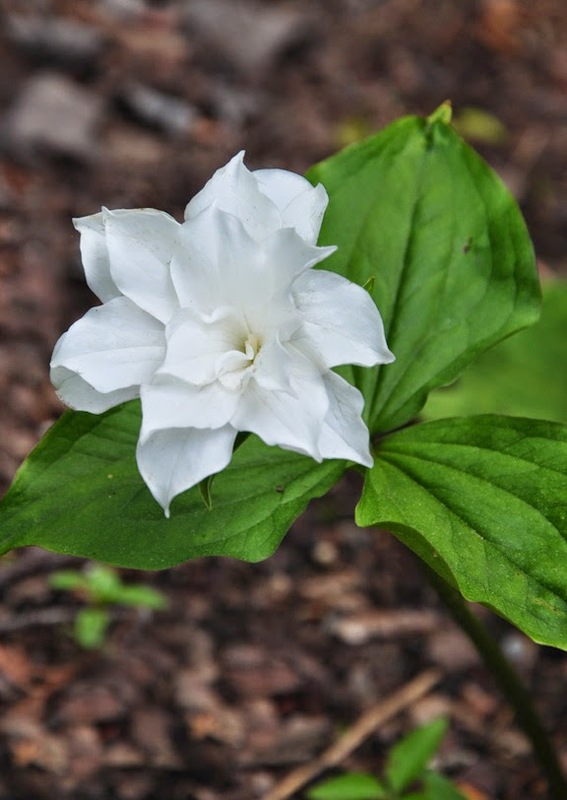 Donna: "Trillium grandiflorum 'Flore Plenum' was a birthday gift from a gardening friend. I hold my breath every spring until it appears. Then there is mandatory viewing for friends, neighbours and even total strangers." 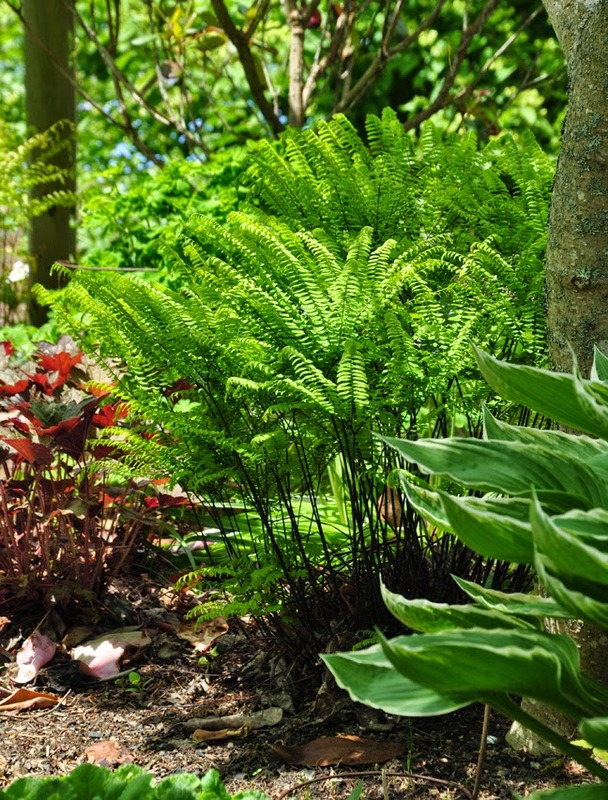 Donna: "Maiden Hair Fern, Adiantum pedatum is a shade lover, pest-free and looks good with everything. What more could you ask?" Maidenhair Fern, Adiantum pedatum has arching black stems and fans of green leaflets. The foliage is great in cut flower arrangements. These ferns like rich, moist soil. You may find that they take several years to reach a mature size. Height: 30-60 cm (12-23 inches), Spread: 30-60 cm (12-23 inches). USDA Zones: 2-9. 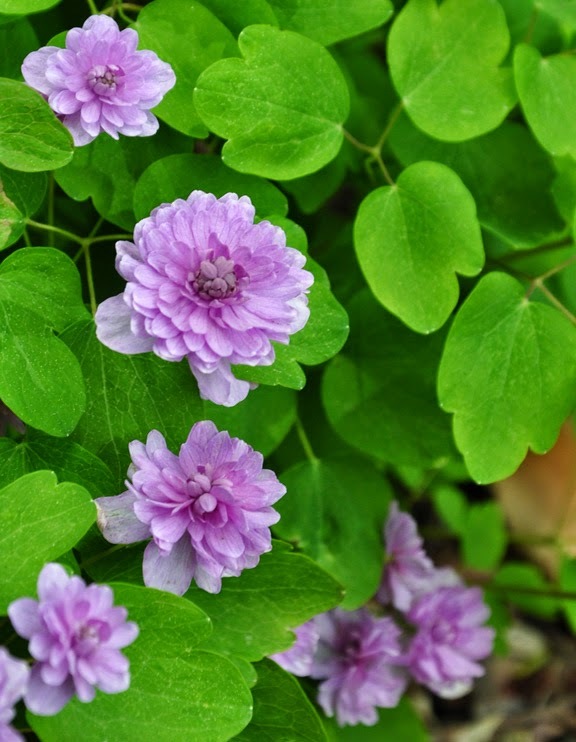 Donna: "Anemonella thalictroides 'Shoaf's Double'. Just being able to let that trip off your tongue makes you a gardener. It blooms for about a month." 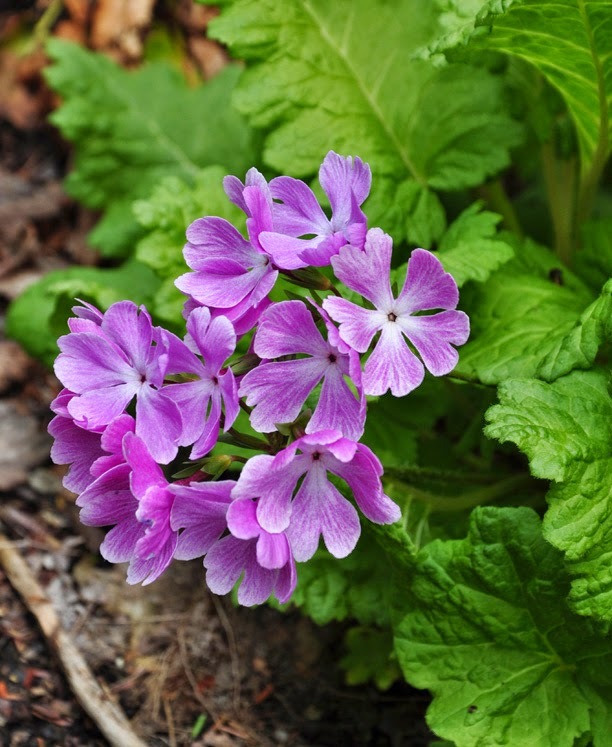 Donna on the subject of Primula kisoana alba: "I love the pink form too. They spread by runners, but are not invasive." In the background is Brunnera 'Jack Frost' with tiny blue flowers. Brunnera macrophylla 'Jack Frost' has heart-shaped, silver colored leaves that are veined in a bright green. Sprays of blue flowers, which closely resemble forget-me-nots, appear in mid-spring. 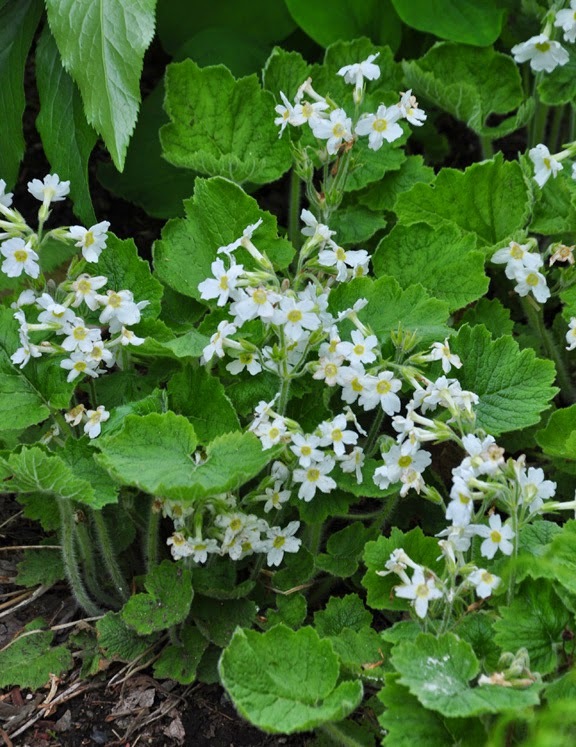 'Jack Frost' can take more sun than many other types of Brunnera, but it prefers afternoon shade particularly in hotter gardening zones. Average garden soil is fine, but 'Jack Frost' likes moist conditions. Height: 30-40 cm (12-16 inches), Spread: 30-45 cm ( 12-18 inches). USDA Zones: 2-9. 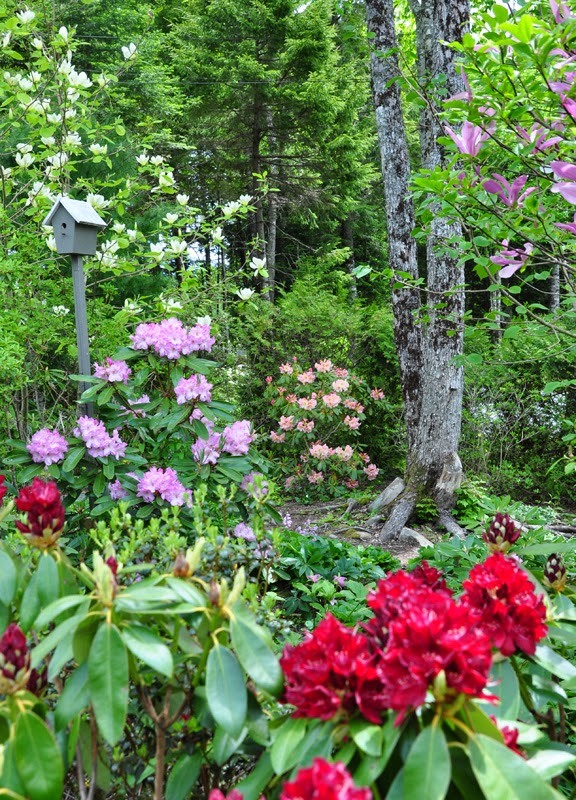 There is a nice collection of rhododendrons and magnolias in this area of the garden. Donna: "Magnolia Susan is one of "the girls" from the US National Arboretum. I like it because the blossoms open over several weeks and you always have a combination of dark buds and paler open flowers." "It would be difficult to pick a favourite magnolia. 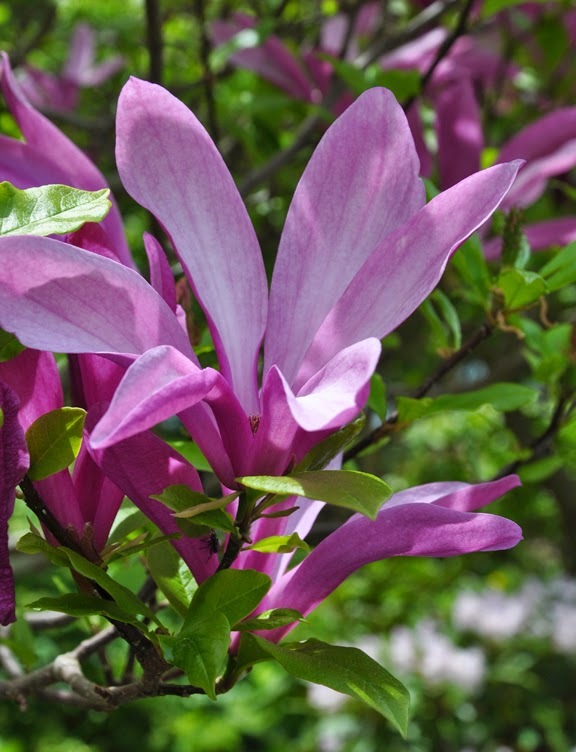 Magnolia 'Butterflies' has wonderful upright foliage. 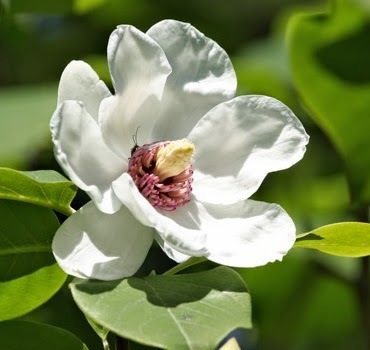 Magnolia sieboldii (shown above) is vase-shaped and suitable for a smaller garden. 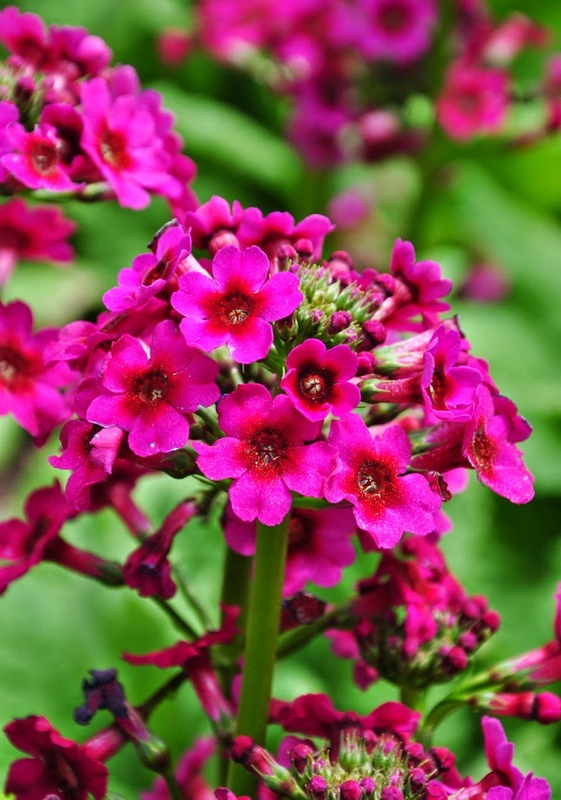 The outward facing blossoms are white with purple centres. In the fall, it has showy red seed pods." 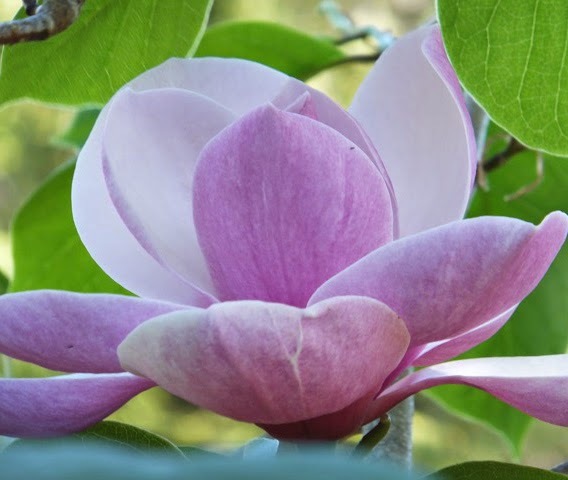 "We were given a collection of magnolia seedlings, started by a friend with seed crosses from the American Magnolia Society. These seedlings, which are now trees, caused great excitement when they first bloomed. 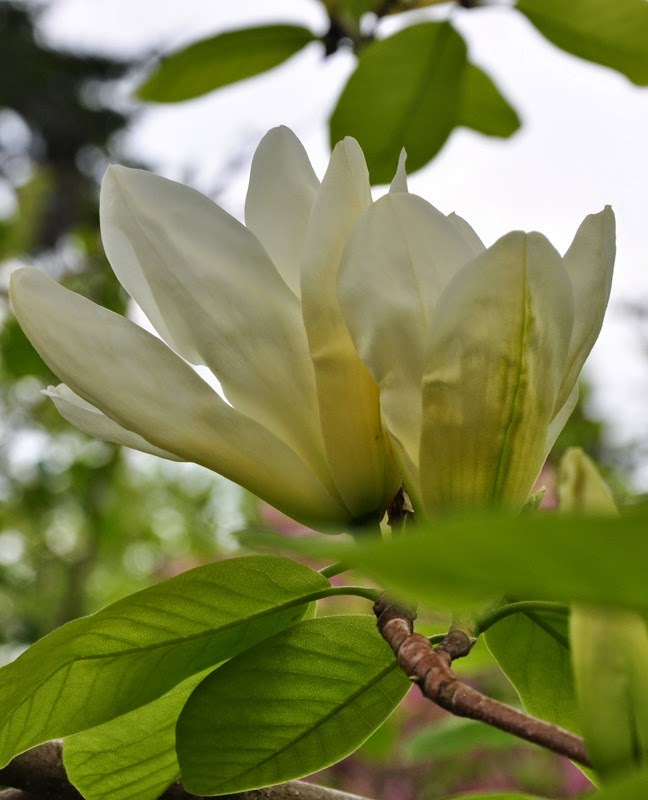 The best of the lot is one we have named Magnolia 'Helen' after our friend's mother. It has caused a stir in the magnolia world. I think our friend would dig it up and take it home if the darn thing wasn't so big. He is working very hard at propagating this beauty." "This area slopes to what was once an ugly divergent ditch, but is now my favourite spring tonic. Siberian iris, Skunk cabbage and native Interrupted fern fill in later. Right spot, right plant. Over the bridge behind "The gate of Lost Marbles" (no need to ask who has lost their marbles) is a compost area". 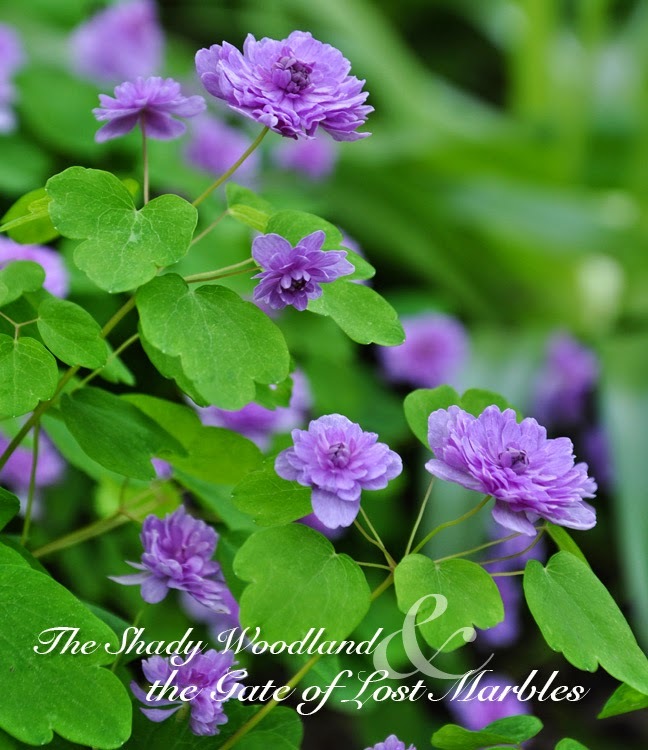 "We lifted the idea for the Gate of Lost Marbles right off the internet. The marbles really shine in February on a fresh fall of snow- a bonus we didn't expect. 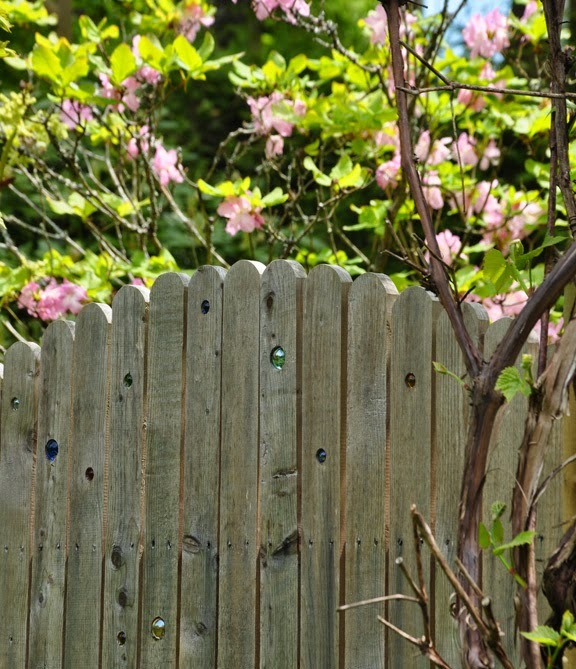 "The gate and the fence is covered with a grapevine that does double duty. It hides the compost bins and gives us wonderful grape jelly. A holding bed and a makeshift cold frame are also tucked behind the gate. 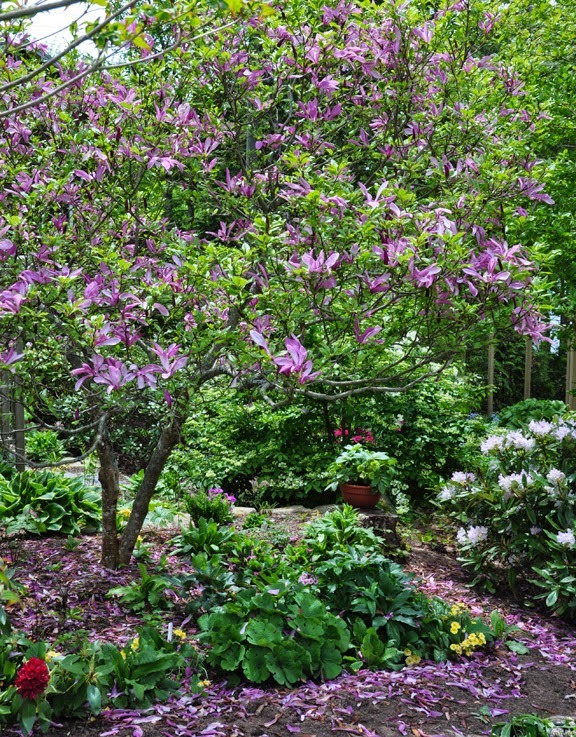 A Red Haven Peach tree and Rhododendron schlippenbachii have somewhat elevated the status of this necessary, but unsightly part of the garden." And so we arrive at the end of this three-part series. What a pleasure it has been to work with Donna Evers to put these posts together. She has put up with endless questions and has always replied to my emails with patience, warmth and a wonderful sense of humour. Thank you, Donna, from the bottom of my heart! Missed Part 1? Go back and read it here. 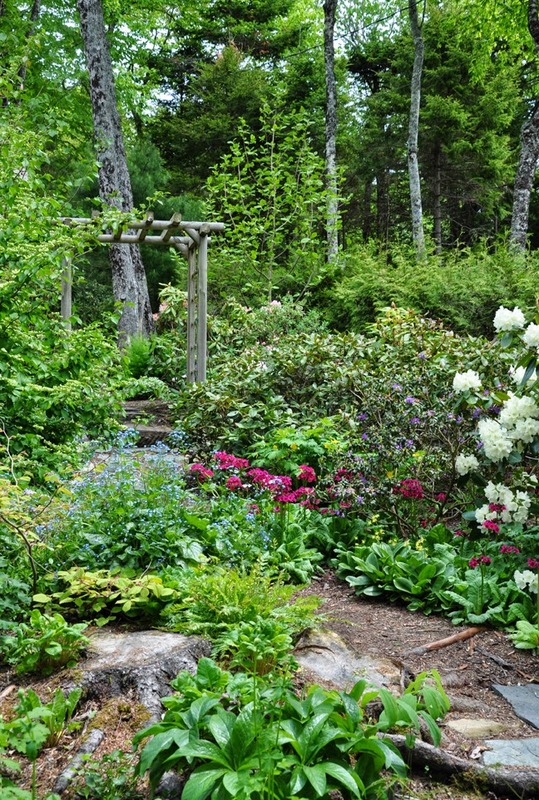 Donna and Duff's garden is a delight and so reminiscent of gardens seen in Scotland but of course Nova Scotia is Latin for New Scotland. I envy them being able to grow Trilliums, my soil is wrong. Why is it we always want to grow the things we cannot? I know what you mean Rosemary. 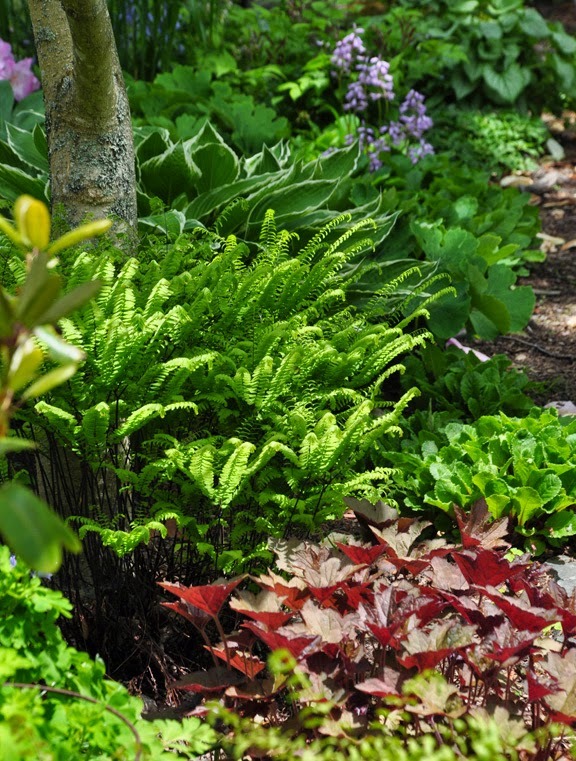 I have dry shade in a good part of the yard and always want to grow ferns, astilbe and other shade lovers that require more moisture than is available in my garden. Breathtaking! Such a beautiful post. Wow, and wow again. All my favorite plants! I have a lot of anemonella but not 'Shoaf's Double, wii have to look for it. What a lovely and inspirational garden! JUST LOVED IT--AMAZING PEOPLE!! 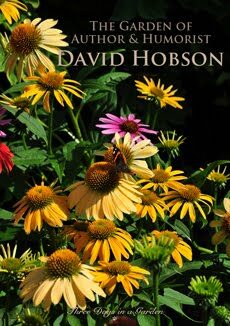 BTW, I WON THE BOOK ON GARDENING BY THE LITTLE GIRL. VERY EXCITED TO HAVE IT FOR MY GARDENING GREAT GRANDAUGHTER, BUT NO WORD ON HOW TO RECEIVE IT?? THX. I tried to find a link to an email address, but couldn't see one. I sent a message through your Google plus page, but didn't hear back, so I am glad that you stopped back in. Please email me your mailing address so I can send the book to you. My address is jenc_art@hotmail.com. Woodland gardening is my favourite sort of gardening, it is beautiful. Such lovely plants and so well put together forming little tapestries of foliage. What a pretty idea - the bridge across the yellow creek! Such at marvelous Woodland! Love that bridge. I have always dreamt of having one. The Anemone is stunning. I have a few myself, but never the double flower one. I love their plant choices. Their rhododendrons are GORGEOUS. Thank you for sharing this beautiful, beautiful garden. It is such a wonderful inspiration and you can see immediately that it was designed, built, and tended with love. Wonderful-ness ♥ so well put together! A truly amazing and beautiful garden. I think it is totally awesome that the owners tend to this garden at their age. I could only hope to be half that active if or when I reach my 70's. This is the kind of garden that dreams are made of, if I was there with my camera they couldn't kick me out until dark...it's beyond radiant and beautiful. The first shot, had me gasp for breath...and no name below it, I was tempted to scroll through and find out for sure if it was a Thallictrum. Which for some silly reason I left behind to my great regret in my old garden. It's been on my mind for the last few weeks...a yearning to find one again. 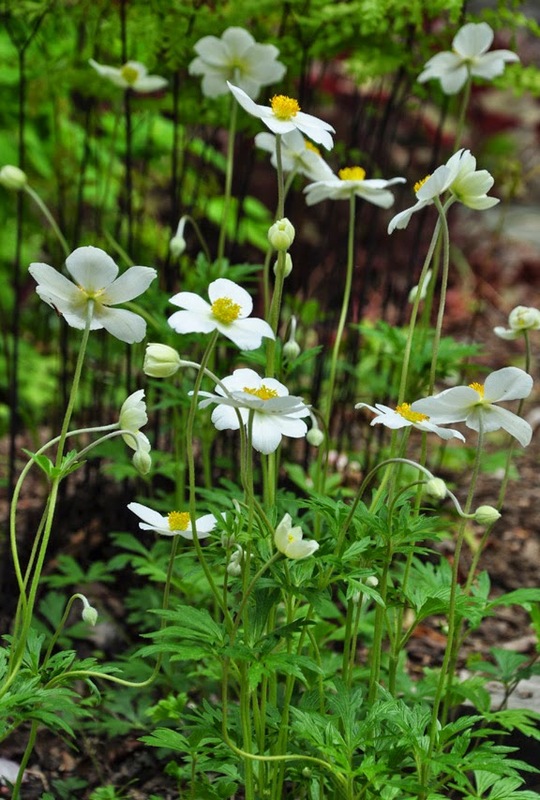 And here is a beauty that supercedes any expectations...Anemonella thalictroides...sigh. Your skill with the camera is amazing, your narrative delightful...and that garden is a joy. Absolutely beautiful Jennifer .. what a wonderful story and illustrated so gorgeously with perfect pictures ! .. I too would love to have this garden ... it would bring the child out in me, especially the little bridge and gateways .. it makes me miss Nova Scotia even more because I can almost smell that distinctive scent from such amazing plants and sea air. I so look forward to your posts ... to see your wonderful photo's and to share beautiful gardens. This series has been an utter delight. 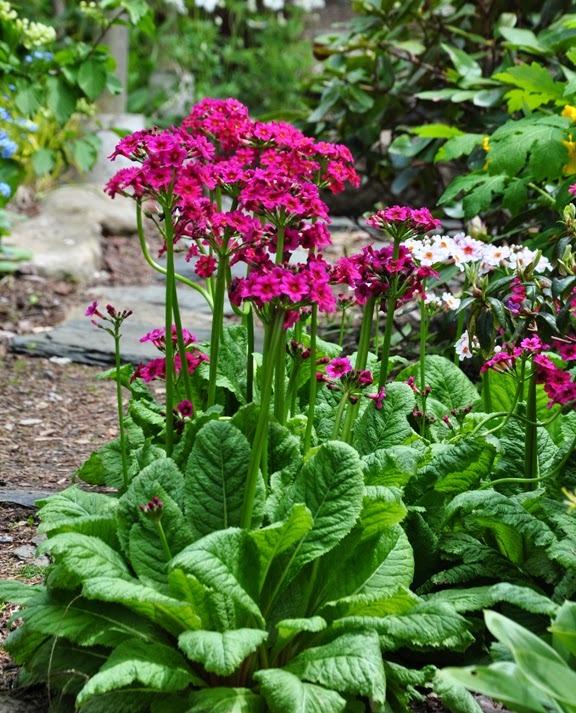 The walk I've enjoyed through the garden and particularly the colour of the 'primula japonica' and as for 'the Gate of Lost Marbles' well just a great touch. Have a good week, think the weather is improving. Absolutely breath taking. I certainly have garden envy when I look at these photos. So many plants I would love to try here. How beautiful! Came over from New House New Home. What a blessing to have enough property for all of those rhodies and magnolias. Your photography is amazing. And I might be lifting the marble gate for my own yard here. It is so beautiful! How fabulous! I love that bridge and the arbour. This garden looks so fresh and beautiful, gorgeous use of colour and texture. 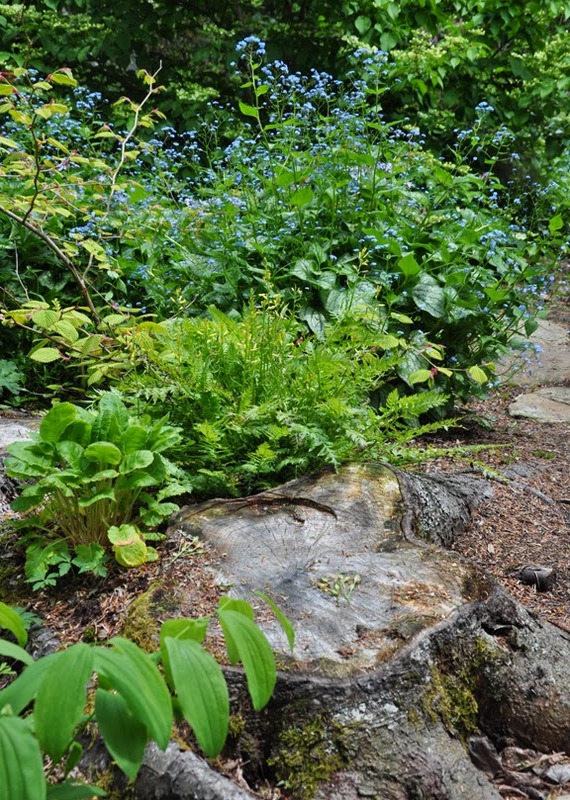 How lucky you were to see this garden in person...amazing especially this woodland garden! 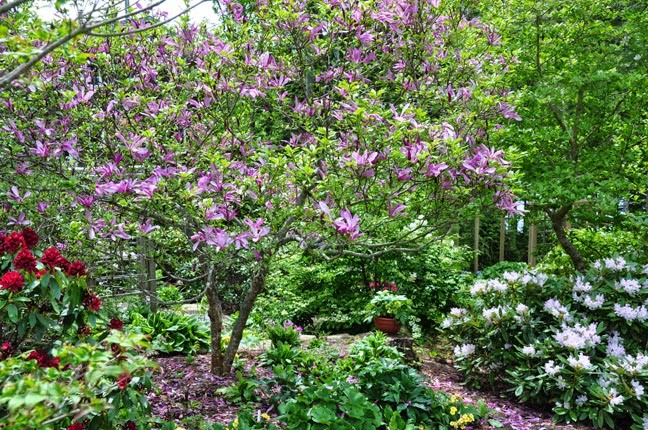 Again, my heart flutters over their beautiful woodland garden! I can tell it is a true labor of love. I love the Gate of Lost Marbles! 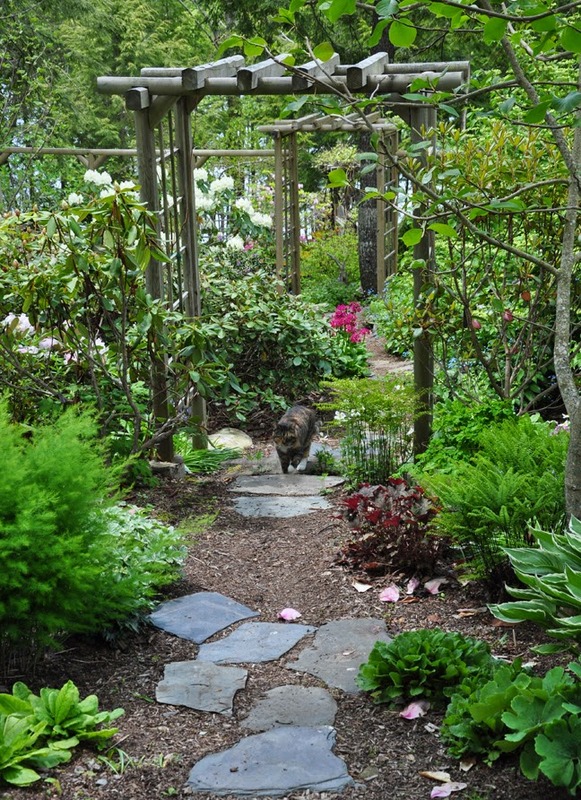 Thank you for your gorgeous photos of a very special garden. Thank you for sharing the rest of this garden, Jennifer. What a beautiful place! I could see spending a whole afternoon here, and even then you would probably miss something. 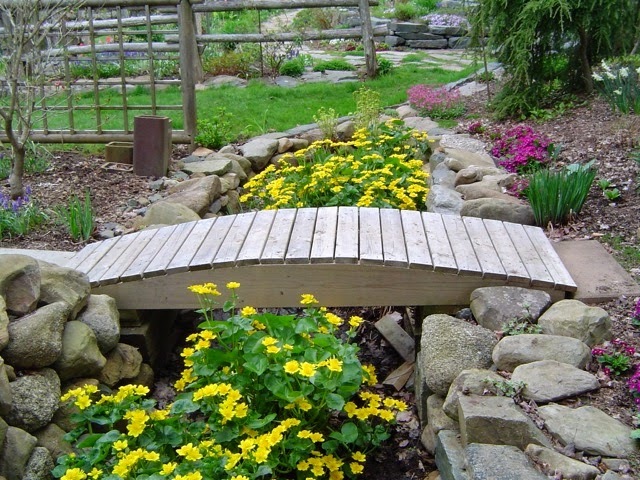 Love the bridge and the gate, and I now I'm really wanting to add some primulas to my garden. Make your own Custom Postage Stamp!